In this paper we have investigated the ripples in graphenes under thermal agitation. It is known that as temperature increases ripples originate in the flat landscape of a graphene sheet which is responsible for changing its properties. 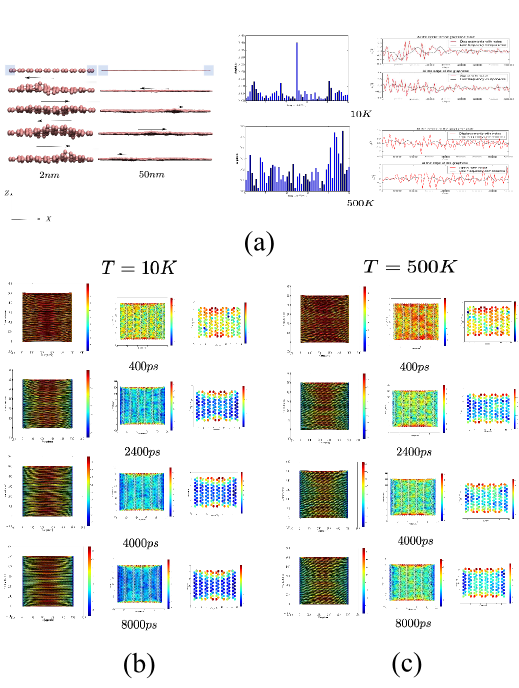 Among a limited number of works available in literature the role of length scales and temperature on the characteristics of the ripples has been investigated. However it is important to include the boundary conditions with other parameters in order to get a broader picture. In this work graphenes with three different sizes (2 nm, 10 nm and 50 nm) were considered under both simply supported and free-opposite-sides boundary conditions at different temperatures (e.g. 10 K, 100 K and 500 K) using molecular dynamics simulations. The variation in natural frequencies and their dependency on the boundary condition, length scale and temperature was thoroughly studied. Change in the boundary condition can introduce new modes of vibrations in graphenes. A combined effect of length scale, boundary condition and temperature was shown to be responsible for developing the geometrical patterns in the ripples. With free-opposite-sides boundary conditions the ripples are more harmonic in larger graphene than other cases. It was also noticed that the probability distribution for the off-plane displacements of the carbon atoms in graphene are typically non-stationary at small length scales. Variation in boundary conditions and length scales may affect the kurtosis of the distribution. The results showed adequate agreement with available data in the literature.